These are a good refrigerator cookie with orange peel in them. There is enough for a nice citrus flavor, but not enough to over power. The good thing with refrigerator cookies is that you can slice and bake them when you want to, thus you can have warm cookies to go with your coffee or milk. The directions call for dipping in chocolate if desired, but we think they are good with out. The recipe is from Gold Medal Cookies & Bars 2005, one of the small paper back books you could buy at any grocery store. Sue and I have been going through some of our cookbooks and I have found several I haven’t made for awhile. It’s always fun to read through older cookbooks and see how recipes have evolved. with electric mixer until well blended. Stir in pecans. 2. Place dough on 14 inch length of plastic wrap. 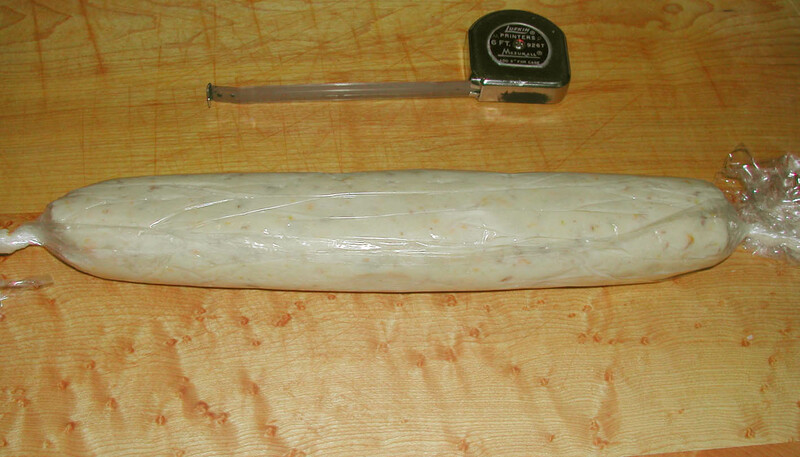 Use wrap to shape dough into a roll, 12 inches long and 2 inches in diameter. This will be quite sticky, but do not add flour. It sets up just right. Anymore flour will make them too dry. Wrap in plastic and refrigerate about 2 hours or until firm. 3. Heat oven to 375°. Cut dough into 1/4 inch slices with sharp knife. On ungreased cookie sheet, place slices 1 inch apart. 4. Bake 8 to 12 minutes or until edges begin to brown. Remove from cookie sheet to wire rack. Cool completely, about 30 minutes. Any Shortbread type cookie is always better if it sets for at least a day to mellow. If you can keep from eating these do try letting them set. 5. In small microwaveable dish melt chocolate chips and shortening uncovered about 1 minute or until softened stir until smooth. Dip half of each cookie into chocolate, allowing excess to drip back into dish. Place on waxed paper; let stand about 30 minutes or until chocolate is set. Hi. 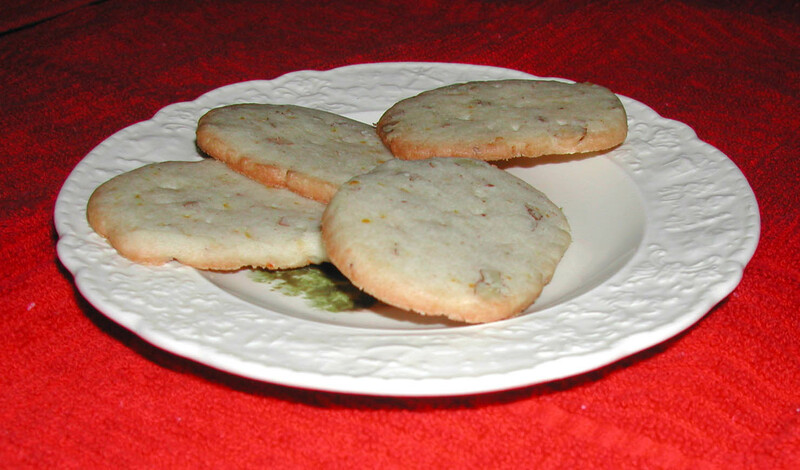 I have copied this Orange-Pecan Wafers recipe. They look so yummy! I haven't made these for awhile. I am now going to make a batch this week. I just rarely buy that style of cookbooks and so no I don't know. Most of that type of cookbook assume you know how to cook and bake and give minimal directions and are prone to errors and typo's. If you do a lot of cooking than you can spot them and enjoy the books.